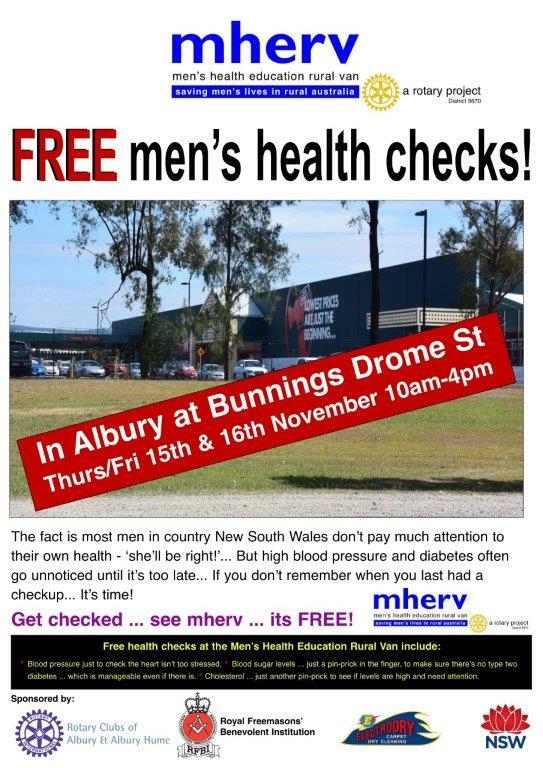 MHERV at Albury Bunnings Store Thursday 15th and Friday 16th of November from 10am to 4pm. Rotary Club of Albury and Rotary Club of Albury-Hume are sponsoring the Men's Health Education Rural Van (a Rotary Project of District 9670). Come and get checked - Its Free. The fact is most men in country New South Wales don't pay much attention to their own health - "she'll be right!' But high blood pressure and diabetes often go unnoticed until it's too late. If you don't remember when you last had a checkup ... Its time!